How Linkless Mentions Can Help Your Search Efforts - Bruce Clay, Inc.
Search Marketing » Bruce Clay, Inc. Blog » How Linkless Mentions Can Help Your Search Efforts - Bruce Clay, Inc.
Linkless attribution is the mention of your business or brand without a hyperlink. An instance of linkless attribution is sometimes called a linkless mention. Links have proven an easy target for spammers. Search engines have made efforts to break the dependence on links as a ranking signal. Mentions of your business or brand, even mentions without links, can send signals to search engines. If the mention is positive, good for you. If it is negative, pay attention in case you have an issue to clean up. And let’s be clear here. I’m not talking about spam mentions. None of that shady stuff. Comment spam is not transferring credibility to your business. Search engines likely use the same quality assessment filters on linkless mentions as they do hyperlinks. Since the search engines’ crackdown on manipulative link spam, SEOs have adjusted strategy. That’s a long way to say: The end goal of the search engine is to accurately judge the pages people think are important. Linking to a business is just one thing people do when we think a business is important. Primarily we talk about the business. Enter mentions. He’s talking about the value of people mentioning you in reviews and in social media. Here’s another quotable. David Amerland sums it up when he says that people’s comments “help create validation independent of your own website.” Yes and yes. 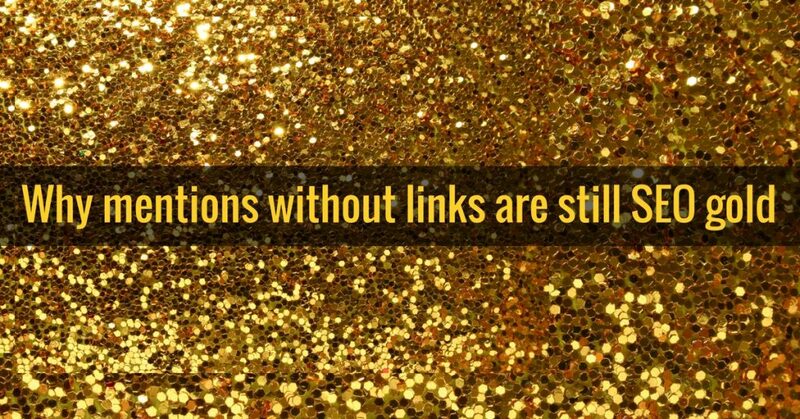 In similar realms, linkless mentions share a border with the land of nofollow links; neither counts for link juice, and they have similar benefits. A mention is just more subtle than a nofollow link. It’s no secret: Word-of-mouth marketing is one of the most important forms of marketing there is. And the majority of word-of-mouth marketing on the internet is done through nofollow links. I’m here to tell you that you don’t have to fear the nofollow link or the linkless mention. Years ago, using press releases to drive links and boost rankings became a popular SEO work item. Its merit is debated even today. Businesses were built around providing press releases for link building and SEO boost, and the practice still has a dedicated following today. Search engines devalued links in press releases, but the value of PR is still huge. Done correctly, a well-designed and executed PR program can yield the exact results you think you seek. But what if, after all your care and diligence, that article doesn’t drop a link? What if the publisher only links to paying sites (a common practice with the popular big names these days)? What if they just mentioned your name once or twice in the article? No URL, no domain and no link … Was it all for naught? Relax. There’s still plenty of value in a linkless mention. All that effort you put into crafting the plan, executing it, reaching out to the right people, answering the questions and so on … it all still helps you. The next step for anyone reading about you in an article, when there is no link, is to search for you. If they are interested, they’ll search. Now brand search comes into play for you. How well you rank for your products plays a role at this stage. All those past efforts to improve rank now come into play to secure that new visitor. Then your UX plays a role to converting them into a customer. Then your email program steps in to help keep them coming back for more over time. All of that because you got the mention in an article. But the benefits don’t end there. If the brand is searched enough, it can become an addition to the predictive search drop-down, potentially furthering engagement. If the product is new or unique, the same action can happen. These can work to cement your position in rankings if searchers are finding you and clicking through to you. When you take off the link blinders, you remember to pay attention to marking up your content or products, allowing the engines to start using your content in knowledge panels, including rating data and so on. The truth is that with repeated, non-linked mentions across multiple trustworthy sources, your business can see benefits. You might not see direct traffic from sources mentioning you, but the longer term benefits can easily outweigh the short-term traffic bumps. Linkless mentions are a long-term investment that spreads your name far and wide. The engines can see this happening, and they’ll wonder why your brand or product is becoming more important. Then they start testing you in results to see if you please searchers. That’s the ultimate goal. Pleasing the consumer. The engine wins and so does the business. Want to explore how our experts can help with your SEO goals? Request a conversation or call us today. Virginia, no has suggested a mention is more important, as important, or anywhere close to as important as an actual link. My question is: what evidence is there that a mention is a ranking signal? Please point me to any study showing the ranking of any site improved due to a linkless mention. It’s a bold statement to state something is a ranking signal. I’m looking for something to back it up. Bottom line: I visit this site instead of others because of perceived credibility. The E-A-T that is mentioned. But this article caught my attention due to the ranking signal claim. I’m wondering if part of it should be withdrawn? There are plenty of benefits mentioned in the article I agree with, but I’d like to see more about the basis for stating not just Google, but “many” of the search engines are using mentions as part of their algorithms. Thanks. I am also finding that linkless mentions are having a positive impact on some of my clients websites. They won’t have the same power as backlinks obviously but they will be yet another search factor Google takes into account. Great article! Glad it was eye-opening, Tanya! Mentions without links make perfect sense. I will be incorporating this in my strategy moving forward. Thank you for this valuable information. Daniel, I couldn’t agree with you more. This article has been understood by some as claiming that linkless mentions are on par with links, and they’re not. But Duane’s making the novel point here that mentions have value themselves, too. Priorities are critical, of course. In the long-term, linkless mentions will likely increase in providing more value from a ranking perspective. However, at the moment, while it’s important to secure linkless mentions via online PR, establishing quality links should always be one of the top priorities for any online brand. I wonder how accurately the search engines can discern which entity is being referred to when there are two or more companies/brands existing with a similar name but in different markets/industries? Take my company for example, selling printer cartridges under the trademarked brand ‘Ink Factory’, but if you Google the term ‘ink factory’ you will see a number of other sites in different markets. Now Google the term ‘inkfactory.com’ and you’ll see Google is still wondering if you might have meant one of those others. Granted, we’re not a big brand name, but we’ve been online since 1999, first as theinkfactory.co.uk and later switching to inkfactory.com in 2003 (when we had the chance to secure that domain). If Google can be this unsure about whether people really mean inkfactory.com even when they literally type that in the search box, I don’t have much confidence that they will attribute any relevant mention of ‘Ink Factory’ to us. I should add that for the most part we have our trademark as our username on Twitter, Facebook and even Google+, so there should be no confusion – but there clearly is. Would be interested in other opinions on this? I never thought of linkless mentions as having SEO value. A well-reasoned post on the subject! It has been noticed that these sites that has brand searches, gain more authority. So, it seems reasonable. Thanks for spotting the light on this underestimated signal! I new that mentions of a business was relevant in more less gorilla marketing, word of mouth more less but never realized that it had value in the serps for adding authority to a site. Great post! Totally agreed with your post. N doubt that each day SEO industry comes up with amazing techniques & tactics. Glad to read your post. Keep sharing. We respect your opinion on this, Brian. And just to emphasize, linkless mentions aren’t more important than links or anything. Just know they’re one signal of many that the search engines are taking into account. Until there is a study and actual evidence showing a “linkless mention” has any impact on rankings, this is useless. If a company or brand is getting a lot of mentions, say from the Super Bowl, and as a result people go searching for the name that may influence rankings. But that is a different story and not what this article promises. One obvious problem is this is limited to a name. If your website is ranking #15 getting mentions might boost sites #1-#14 above you more. Presumably, though, you can already rank for your own brand name. Hmmm interesting I always thought without the link having just your company name on another website was useless. Glad I know better now thanks! Great article I am also finding you can boost your SEO results with linkless mentions along with standard backlinks. It probably makes your link profile look even more natural. I question whether or not a linkless mention has the same power as a do follow link but it should definitely be added to your SEO strategy. linkless mentions can actually provide benefit to you! wow, that’s a new thing for me. It’s making me wonder that how quickly SEO practices and results are changing!! Need to thank Paula Allen for your mentions in inbound which made me to come here linkless mentions are great source for seo’s will implement this in any of my articles or blogs, thanks. Whenever I find a linkless mention of my business, I immediately try to reach them to see if they can provide a link back to my website. I guess I have to recheck my SEO strategy. Really insightful article. thank you for your comprehensive article. Even though I think that links are still too important to ignore I agree with you that linkless mentions are a valuable contribution to direct marketing activities as well as indirect seo. Great article! It was very interesting and I learned a lot from it, thanks! make sure people search for your brand by using it. If they search it, google will use that metric for your positions / reputation. Ya you are correct,Although there are lots of spammers and doing only backlinks. Indeed they are not only making backlinks but also commenting on others blogs well. But when 2012 googgle launch new updates all are shutting down. Absolutely agree that Search Engines are probably moving towards linkless mentions. Back around 2012 BC Australia had released a report that referred to this as Web Signals. I believe Yandex already disregards links in its algorithm for commercial intent queries. I myself also feel that this is the best way to Build your Brand. Sure if I can get a link that is even better but I will still love the linkless links. Spot on Duane!